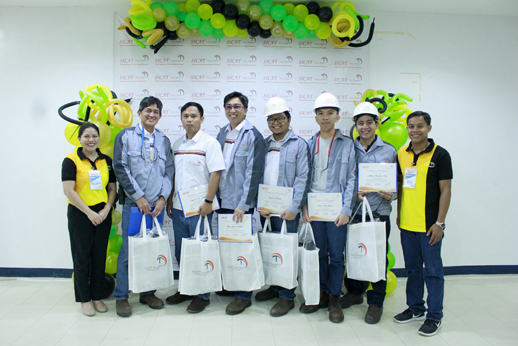 Winners of the recently conducted TeaM Energy Skills Improvement in Control Analysis Tournament (SICAT) at the Pagbilao Power Station, receive their certificate of participation during the tournament’s awarding ceremony. SICAT is a unique skills competition among members of the power plant’s operations group. It is a way to sharpen the skills of the power plant engineers as part of ensuring the reliable supply of electricity. The competition is meant to test their preparedness to deal with technical issues and emergency situations in the control room that may threaten the power plant’s continuous operations. In photo from left to right: Techie Lopez, AVP, Corporate Affairs, TeaM Energy; with this year’s SICAT champions, Luis Zaide III, Shift Manager, Main Plant; Juanito Cadelina III, Shift Supervisor, Main Plant; Jeffrey Boy Castro, Senior Control Operator, Main Plant; Daryl Oineza, Control Operator, Main Plant; Arjay Paquilabre, Plant Operator, Main Plant; and Jo Marco Bernel Tabi, Plant Operator, Main Plant. Together with Val Alcazar, Manager, Technical and Compliance Training, TeaM Energy. TeaM Energy is a partnership between two noted Japanese firms, TEPCO and Marubeni Corporation. It is the largest Japanese investment in the country with over 2,000 MW of installed generating capacity in Luzon. TeaM Energy operates two coal-fired power plants: the 735 MW Pagbilao Power Station in Quezon Province and the 1,200 MW Sual Power Station in Pangasinan. It also has a 50% stake in the 420 MW Pagbilao Unit 3 Power Project in Quezon and a 20% stake in the Ilijan natural gas project in Batangas.